Before we get started, we have a few words of caution. If you have kiddoes around that will be enjoying the tub, or if you have any folks who may have health issues if they take a dip, then you may need to lower the temperature of your spa. Be mindful that some people shouldn’t use hot tubs if they have certain health conditions, and they should consult a physician if they’re considering using a spa. In addition, pregnant women should also consult a physician before using a hot tub. Younger children (those under the age of 5) should only take a dip if the temperature is below 95°F, and they should only sit in the tub for 5 to 10 minute intervals. Always supervise children that are enjoying your hot tub. Now, if you’re one of the many hot tub enthusiasts who prefer their spa as hot as it gets, you’ll likely be setting the temperature to 104°F. This is the highest UL-standardardized temperature allowed for hot tub manufacturers, since higher temperatures can be dangerous or hazardous to your health. If you max out the hot tub temperature at 104°F, you’ll find your spa quite hot, yet still safe for a soak. Some folks prefer to adjust their spa temperature throughout the year to reflect the weather outside. For instance, you may want to have your spa fairly hot in spring and fall, piping hot in winter, and lukewarm in the summer. 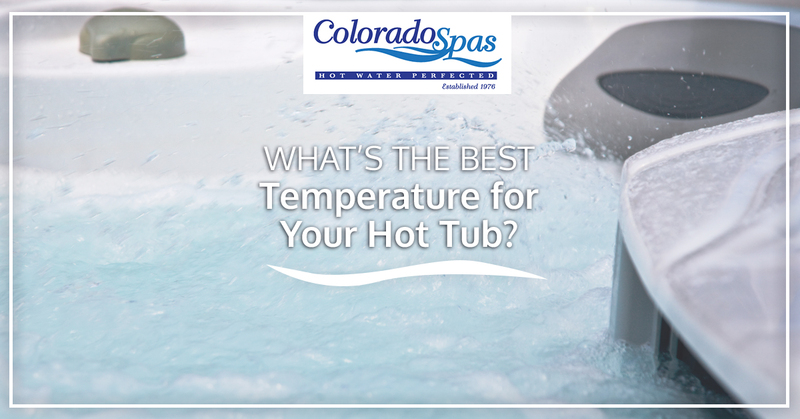 You’re always welcome to adjust the temperature of your hot tub as outdoor temperatures rise and fall. Minimizing the temperature of your spa in summer is fairly common, actually, since it can serve as a “small pool” to actually cool off throughout those hot, sunny days. Simply set your spa to the lowest temperature setting, ensuring that it continues to filter the water in the tub. Be mindful that if you are adjusting the temperature in your spa, you shouldn’t do it too often or too quickly. Adjusting the temperature often can strain the components of your spa, and that wear and tear can decrease the longevity of your hot tub. Instead of constant adjustments, you can slowly adjust the heat range of your spa as the seasons change. If you’re going to be away from your hot tub for a while, you may be wondering if you should lower the temperature to save a bit on energy costs. That’s a good idea. If you’re heading out of town for a few days, you can lower your spa by 5 degrees lower than your usual setting to save a bit of energy. Then, when you return you can raise that temperature up without straining the tub much — the temperature should be back to normal in a matter of hours. If you’re going to be gone for more than a week, you can lower the temperature of your tub even further. You can turn your spa to energy-saving mode if it has that feature, or lower your spa to the lowest allowable temperature. You’ll want to keep the spa on to keep the water fresh and filtered. If you ever need more advice about your hot tub, its temperatures, and how to make the most of your spa time, we’re always here. Give us a call with any questions that you may have, and feel free to stop by our spa showroom in Fort Collins at any time!